← Κυκλοφόρησε το νέο τεύχος του ιεραποστολικού περιοδικού Άγιος Κοσμάς ο Αιτωλός ( Α’ τρίμηνο 2018 ). Διαβάστε ON LINE. 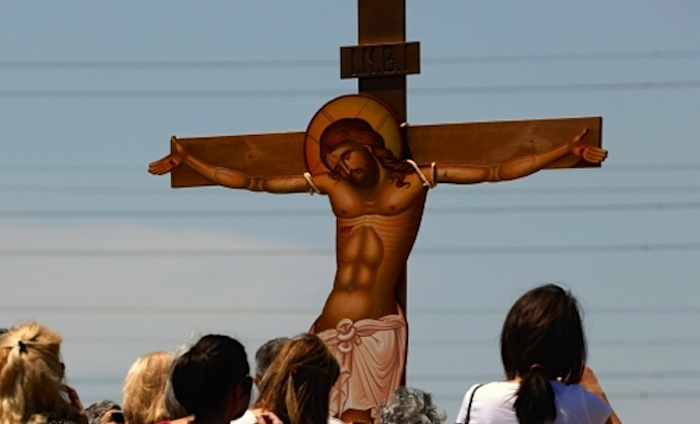 As a consequence of these two factors, the Orthodox Church usually celebrates Pascha later than the Western Churches – anywhere from one to five weeks later. While this year Catholic Easter is today the Orthodox Church will celebrate it next Sunday, April 8, 2018 (in 2016 Orthodox Easter is on May 1st). Occasionally we do celebrate Pascha on the same day. The last time that occurred was in 2011. Sigh. It’s time for that annual round of ABSOLUTELY WRONG “Why Orthodox Pascha [Easter] doesn’t line up with Western Easter every year” articles. It’s very simple. The basic principle is: Pascha happens the first Sunday following the first full moon following the vernal (spring) equinox, which is assumed as the invariant date of March 21. This was established by the First Ecumenical Council, held in Nicaea in AD 325. 1. The Orthodox use March 21 on the Julian (Old) Calendar, which differs by some 13 days from the Gregorian (New) Calendar. If a full moon occurs in this interval, the Paschal dates will be off by quite a bit. 2. The full moon is determined not by observation, but according to tables that say when it is according to the year in a cycle. The Orthodox have a different table than the Roman Catholics (and, consequently, the Western Protestants). The differences have nothing to do with observing Pascha after Passover. The first Nicaean Council explicitly de-linked Pascha from Passover, which, due to Jewish rabbinical decisions could move from year to year. The Council wanted to free the Christian Church from this variability. This entry was posted in America, Australia, Canada, Ασία, Ασία, Asia, Αμερική, Ελλάδα - Greece, ΗΠΑ - USA, Ισραήλ - Israel, Ιορδανία -Jordan, Κύπρος - Cyprus, Καναδάς, Ορθοδοξη μελέτη της Αγίας Γραφής, Πατριαρχείο Ιεροσολύμων, Παλαιστίνη -Palestine, Patriarchate of Jerusalem, Uncategorized and tagged Christian Church, Easter 2018, ierapostoli.wordpress.com, Ορθόδοξο Πάσχα, Jerusalem Orthodox Christian Patriarchate, Jerusalem Orthodoxes christliches Patriarchat, Orthodox Christian Easter 2018, Orthodox Christian Ostern 2018, Ortodoxo cristiano Pascua 2018, Pasqua cristiana ortodossa 2018, Patriarcado cristiano ortodoxo de Jerusalén, Patriarcat chrétien orthodoxe de Jérusalem, Patriarcato cristiano ortodosso di Gerusalemme, Pâques chrétienne orthodoxe 2018, القدس الأرثوذكسية البطريركية المسيحية ،. Bookmark the permalink.